Chief of Staff of Nepal Army Purna Chandra Thapa received Rawat in Tribhuvan International Airport in Kathmandu today. 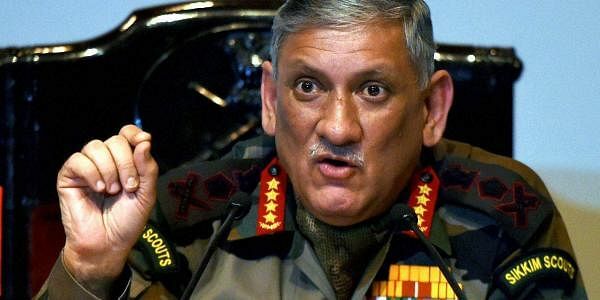 KATHMANDU: Indian Army Chief General Bipin Rawat arrived here today on a four-day official visit to Nepal during which he will be conferred the honorary rank of general of the Nepal Army and hold talks with the top leadership. Chief of Staff of Nepal Army Purna Chandra Thapa received Rawat in Tribhuvan International Airport in Kathmandu today. As a tradition between the two national defence forces, Nepal President Bidhya Devi Bhandari will confer the honorary General of Nepal Army to Rawat at a special programme at her official residence 'Sheetal Niwas' tomorrow. During the visit, the Indian army chief will call on Prime Minister Prachanda, Defence Minister Balkrishna Khand and will meet his Nepalese counterpart Rajendra Chhetri, according to a statement issued by the Nepal Army. According to Nepal Army Spokesperson Brigadier General Bal Jhankar Bahadur Kadayat, Gen Chhetri will be hosting dinner for his counterpart at his residence this evening. Gen Rawat will also visit famous tourist spots and pilgrim sites in Nepal besides inspecting the high altitude training centre of Nepal Army and visiting the Indian Ex-Army pension paying camp situated in Pokhara. Then, he will go to Manag and visit Muktinath temple. Rawat, who became the chief of the Indian Army on December 31, is also scheduled to visit Pashupati Nath temple. Such high-level exchange of visits between Nepal Army and the Indian Army will help deepening and expanding bilateral relations between the two armies, the statement added. Rawat's trip to Nepal comes days after Chinese Defence Minister Chang Wanquan visited the country.